After talking to few people about the need of another Gandhi i left for Aug 15 celebrations at Church, where we had different competitions and programs. It is a big story, keeping it short with some images. Enjoy! speaking on "Never Never Never Quit"
Skit was more fun as we mixed up our dialogs and director was all shocked and we were all laughing and laughing …..
Pic2: I am left on stage without co-actors as they misplaced their costumes and I was asked to cookup some runtime dialogs. Pic 4: He forgot the scene and was not falling on my feet and I kept on repeating the same dialog. We had to be reminded by the director. Overall it was more fun that we thought, I enjoyed the day. 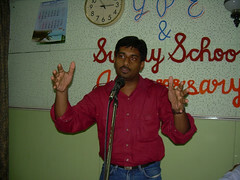 The topic of the final speech was “How you can and should make a difference in the society”. There were few interesting stories with great morals. I will be writing it over all soon. Hi Isaac, please add your blog to our new directory of Indian Blogs, thanks! I will do it next week for sure. Previous PostPrevious Do India need another Gandhi?